Conductors: Plain annealed copper wire, stranded according to EN 60228 class 2 or class 5. 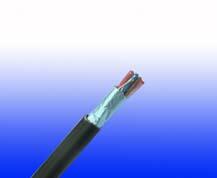 Cable elements: Insulated cores are twisted to form pairs. Cabling: Pairs are cabled together. Overall screen: Aluminum/polyester tape with copper drain wire. Outer sheath: Thermoplastic LSZH compound. Insulation Colour: According to IEC 60189-2 (other colour code on request). Sheath Colour: Colour red (other colours on request).